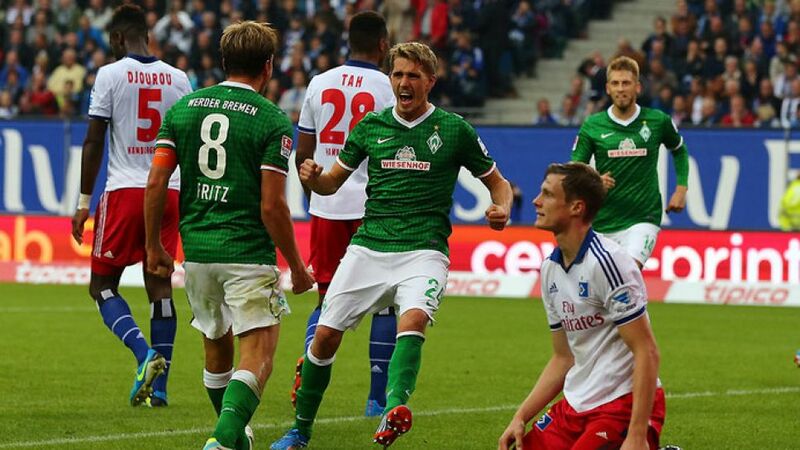 Munich - Nils Petersen's brace either side of half-time helped SV Werder Bremen to victory in the 99th Northern derby against Hamburger SV, while both VfL Wolfsburg and Hannover 96 managed to overturn deficits against 1899 Hoffenheim and FC Augsburg respectively. With both sides hoping to bounce back from heavy Matchday 5 defeats, the opening exchanges of the Bundesliga's most-played fixture were dominated by nerves. Werder looked the more dangerous side, however, as Argentinean left-back Santiago Garcia fired off an early warning on his debut with a long-range volley, before Assani Lukimya saw his headed effort cleared off the line by Zhi Gin Lam. Bremen's pressure soon took its toll though as Nils Petersen scored his first goal of the campaign just past the half hour mark, finishing from close range following Clemens Fritz's neat move down the right to send the visitors in wtih a one-goal lead at the break. Hamburg, who hadn't come from behind after a half-time deficit on their last 16 attempts, made it clear they were determined to put an end to that streak, as they threw bodies forward in search of an equaliser in their first outing under caretaker Rodolfo Cardoso. Maximilian Beister twice spurned chances to level matters for the Red Shorts, before Tomas Rincon followed suit in failing to get the better of Sebastian Mielitz. Petersen should have wrapped up all three points in the closing stages, squandering a one-on-one situation with quarter of an hour remaining, but the Bremen forward reedemed himself by skilfully chipping the ball over the Hamburg goalkeeper, who had ventured forward for a last-minute penalty. Excitement is guaranteed in encounters involving Hoffenheim and it was no different during the opening exchanges against Wolfsburg. The Wolves strived to apply their influence early, with Ivica Olic, Diego and Vieirinha all looking bright, yet it Anthony Modeste who capitalised on a mistake in midfield to open the scoring for the visitors after rounding Diego Benaglio on the quarter-hour. However, there was cause for concern, as Wolfsburg’s Portuguese winger Vierinha regularly got the better of left-back Robin Szarka, a weakness Christian Träsch capitalised upon in the 43rd minute, crossing for Ivica Olic to mark his best goal-scoring start to a Bundesliga season with a volleyed equaliser. The Croatian came to the fore again three minutes into the second half, this time providing a delicate finish by dinking a bouncing ball over Koen Casteels, who found himself caught in no-man’s-land. The goal completed Olic’s first brace since March, as he and Diego regularly combined throughout the second period to ensure their side’s advantage wasn’t squandered, pressing high up the field and allowing Wolfsburg to impose their style of play. Despite Modeste and Kevin Volland’s best efforts though, Hoffenheim failed to muster up enough to trouble Wolfsburg’s defence, marshaled superbly by Robin Knoche, as the hosts preserved their unblemished home record in the current campaign. Augsburg’s attempt to record a fourth straight Bundesliga win started brightly as they look assured in possession during the opening stages against a Hannover 96 side, without star striker Mame Diouf. His replacement up front, Didier Ya Konan, spearheaded the Reds' response to the visitors’ possession-based start as he, along with midfield duo Lars Stindl and Leon Andreasen, began to pepper the Augsburg goal with shots. The two midfielders were key as the home side managed to exert control over the course of the half, limiting Augsburg to desperate and unsuccessful long-range strikes from Raphael Holzhauser and Halil Altintop. The second-half immediately brought a swing in fortunes for the visitors, who were awarded a penalty, nonchalantly converted by captain Paul Verhaegh. Falling behind provided the impetus for Hannover, who turned their frustration into a breakthrough, Szabolcs Huszti delivering an inch-perfect cross from deep onto the chest of Artur Sobiech, who tapped into an empty net with Alex Manninger stranded. Huszti proved to be the protagonist at the last, as the Hungarian stepped up after Mirko Slomka’s side were awarded a late spot-kick, sending his strike into the top right corner in the 89th minute to end Augsburg’s winning run, and make it four home wins from four for Die Roten.